Many farmers markets in New Hampshire have initiated programs that feature wooden tokens that allow people who receive food stamps through the Supplemental Nutrition Assistance Program to spend their benefit dollars at the farmers market. It’s 18 degrees outside at 9:15 on a Saturday morning in Exeter, but inside the warm, bustling cafe at the town’s high school, it feels like harvest season. Farmers from across the state are busy setting up their displays for Seacoast Eat Local’s winter farmers market, arranging baskets of potatoes, green and purple cabbage, carrots, butternut squash, maple syrup, locally raised meats, milk, eggs, apple cider and honey before the shoppers arrive. At the front of the room, a table is set up with information about the market, along with a basket of small, round wooden tokens marked with “$1.” These tokens allow people who receive food stamps through SNAP (the federal Supplemental Nutrition Assistance Program) to spend their benefit dollars on fresh, local foods at the farmers market. Putting the phrases “food stamps” and “farmers market” together might cause a bit of cognitive dissonance. After all, farmers markets are often viewed as somewhat elitist places where the privileged can afford to spend $4 on a bunch of locally grown, organic carrots. 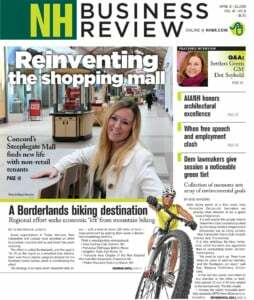 But people at the Seacoast Eat Local market, and across New Hampshire, are eager for that perception to change. “I’m really excited about local food, but I think together as a region that we need to be more inclusive,” says Caty Wilkey, the market’s SNAP program coordinator. That’s why farmers markets across the state are working to educate SNAP beneficiaries about using their benefits at the market, as well as teaching them about “market match” programs that allow them to get double or even triple the benefits when they shop at farmers markets. For instance, the Seacoast Eat Local market and many others provide a matching $10 when people spend $10 in SNAP benefits at the farmers market. Farmers market dollar-matching programs also recently got an additional push with the passage of the new federal farm bill. The Food Insecurity Nutrition Incentive is a small passage tucked into the hundreds of pages of the Agricultural Act of 2014 that President Obama signed into law in early February. The program will provide $100 million to create grants that incentivize SNAP beneficiaries to use their benefits at farmers markets by matching their spending. Doubling the amount of money that people have to spend on SNAP benefits is a huge boon to beneficiaries, says Terry Smith, director of the Division of Family Assistance for the New Hampshire Department of Health and Human Services, because monthly benefits usually don’t last an entire month. “Almost all clients have run out of food within the third week,” he says, which often forces them to rely on food pantries for assistance. Contrary to popular belief, SNAP clients aren’t “swimming” in benefits, nor do they typically abuse them. Instead, Smith says that right now in New Hampshire, a mom and one baby would receive $347 in SNAP benefits per month, which is $5.78 cents a day per person. And SNAP benefits cannot be used for hot prepared foods, alcohol or cigarettes. “You can buy pretty much anything that you can put in your mouth, chew and swallow from the supermarket except vitamins and prepared food,” Smith says, adding that across New Hampshire and the nation, statistics routinely show that only about 1 percent of people abuse SNAP benefits. That’s a small number considering that as of January 2014, 54,276 New Hampshire families, for a total of 113,326 people, were on food stamps. Of that number, 42 percent were children. Many of the able-bodied people who receive benefits are also working. “This is really people who are not being paid enough,” says Wilkey. The use of SNAP benefits at farmers markets is slowly growing, thanks to programs like the market match and other incentives. “It’s more common because the USDA Food and Nutrition Service recently made free equipment available as a patch-through from states to farmers markets,” Smith says. 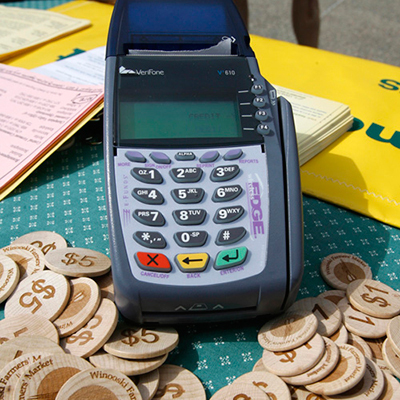 At the Seacoast Eat Local farmers market, for instance, SNAP beneficiaries can run their EBT (electronic benefits transfer) card through a machine, deduct how much money they want to spend that day at the market, and receive the equivalent in dollar tokens to spend with the different vendors. But when every dollar and calorie counts, one might wonder whether carrots from the grocery store are just as good for SNAP beneficiaries, not to mention less expensive. Smith says he worried about that, too, so he checked with UNH Cooperative Extension, which coordinates nutrition for the New Hampshire SNAP Educational program, known as SNAP-ed. It’s a misperception that food from the farmers market is necessarily more expensive than food from the grocery store. Plus, when people spend their SNAP benefits at a New Hampshire farmers market, they not only get some additional money to spend, but they’re supporting local farmers. The farmers are eager to give back to their communities, too. For instance, Wilkey says the market recently got a grant from NH Farm to School that allowed implementation of a gleaning program with local farms, where farmers donate excess food to food pantries. She says Heron Pond Farm in South Hampton, for example, donated one ton of potatoes last fall. “There’s a lot of really generous farmers out there that are really passionate and committed to getting their produce to the wider community,” Wilkey says. Among those farmers is Josh Jennings, owner of Meadow’s Mirth Farm in Stratham and a member of the USDA’s New Hampshire Farm Service Agency State Committee. He says that people who might be worried about using SNAP benefits at a farmers market shouldn’t be. In fact, he says farmers would be the last people to be judgmental, considering that many of them also struggle financially. Other barriers exist too. Transportation to farmers markets can be an issue, especially when convenience stores, grocery stores and big-box stores are nearby. Jennings believes another barrier is that people might not know how to get four meals out of a whole uncooked chicken and a bag of vegetables. That’s why, according to Smith, nutrition and cooking education is a strong component of the SNAP program. Numerous studies have shown that low-income people are more likely to have limited access to fresh, whole foods and are more likely to get their food from places like convenience stores where high-calorie, processed foods are the norm, so promoting the use of farmers markets in these “food deserts” becomes even more critical. Proponents say spending SNAP dollars not only puts money back into the community, but it also promotes the community as a whole, and that means being inclusive. “We don’t want to promote community without promoting everyone from our community,” Wilkey says.